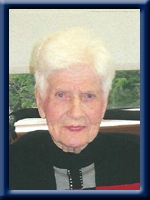 ALICE BAILEY TOBIN, 98, of Mersey Point, Queens County, passed away January 5, 2012 at Melville Gardens, Halifax, where she was a resident for the past six years. Born in Liverpool she was the daughter of Walter and Jennie (Rafuse) Chandler. As an accomplished pianist, music played a big part in her life, starting in her early teens by playing piano for the Silent Movies at the Astor Theatre. Alice was involved with arts, crafts and silver smithing – winning awards in silver jewellery work for original designs. She was a member of the first group of ladies to play at Liverpool Curling Club, and as a member of Trinity Anglican Church also took part in several church groups. Alice is survived by her daughter Chandler (Channie) Vincent, grandsons Paul Vincent (Karen), Peter Vincent (Jackie) and Mark Vincent (Susan), great-grandchildren Kelly Muise (Jeremy), Megan, Erin, Josh, Cory and Jake Vincent, great-great grandson Hunter Muise and sister-in-law Kaye Chandler. Alice was predeceased by her first husband C. Russell Bailey, son Paul Bailey, second husband William Tobin, son-in-law Eric Vincent, brothers John, Robert and William Chandler, and sisters Elizabeth Hazlam and Eleanor Millson. Cremation has taken place. A graveside service will be held Saturday, April 14th, 2012 at 11:00 a.m. in Trinity Anglican Cemetery, Bog Road, Liverpool. Reverend Judy Cross officiating. Donations may be made in Alice’s memory to Trinity Anglican Church, P.O. Box 1363, Liverpool, NS B0T 1K0 or Melville Gardens Enhanced Care, 11 Ramsgate Lane, Halifax, NS B3P 2S9. My thoughts and prayers are with you at this difficult time. I remember your mother very well. She and my mom were great friends years ago. I especially remember your mother playing the piano and singing. She was well thought of by everyone who knew her. The last time I saw you was at the salmon supper in Brooklyn 4 years ago last summer when my husband and I were back for a visit. Take care and God bless you and your family. So sorry to here of her passing ,We will have all our memories of her ,& she will be sadly missed. Our deepest sympathy goes out to all of you. We will keep you all in our thoughts and prayers. Just a note to send my condolences to you and your family. She sure lived a full and long life. I can only imagine her joy when seeing those of her family who have passed on before her especially Russell and young Paul. Keep your faith in the Gospel my thoughts and prayers are with you all. Please let me know when the graveside service will be. Our condolences to all of Alice’s family We knew Alice on Union Street (that was many years ago)Last time I had Margie & myself out for a visit and a great visit it was before she moved into the city. I was very sadden when I had visited the home and Alice had passed. I enjoyed saying hello and our little conversations. She would have a look of kindness in her eyes, I could tell that she enjoyed life and loved music. I will miss our little chats at the home, it was a way to keep our families connected. My deepest sympathy is with you at this difficult time. Our condolences to Alice’s family she was a great lady and always willing to give a hand when needed to the Community Association.I am sure she will be remembered by all who had the pleasure of knowing her. My condolences to you and your family as I received news today that Alice had passed away. Your mom was very special to me & I have fond memories of a summer we spent together in Mersey Point and Moose Harbor. I remember it so well as I was 16 and she was 61 at the time. I often mention it to my wife & friends as it such a wonderful moment and place. Alice always brought such a pleasant force with her & you knew when she was in the room with laughter, song and stories. Certainly, we have an angel watching over us now. You were truly blessed to have your mother with you this many years , my grandparents the youngs lived around the corner from yours, so knew well of the sadness that came to pass for you all, she was a wonderful woman, god bless you all. Our thoughts and love go out to you and the family. As you know Aunt Alice taught me so much – how to drive a standard transmission, how to roll cigarettes 🙂 and so much more, but the most important is she showed me how to enjoy life, how to appreciate and love people, how to always see the positive side of life. As recent as Christmas morning we were talking about Auntie Alice – laughing and remembering how much fun she always was. I know Mom and Dad will be there to welcome her – with smiles on their face. We love you Aunt Alice. while the angels sing a heavenly song.